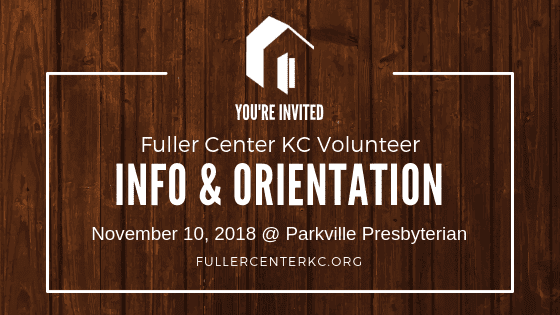 Please join the Fuller Center Leadership Team for an introduction and orientation of our mission in the community, our goals, and what you can do to help us. Our October BBQ Fundraiser Event was a great success and we have lots of opportunities to help our community with safe, affordable housing as well as help others to remain in their homes. If you would like to attend, please send an email to linda@fullercenterkc.org or call 913-951-1821. Thank you for considering serving your community through Fuller Center for Housing Greater Kansas City!